The term "therapy animal" might bring to mind a well-trained dog visiting nursing home patients. Canines aren't the only animals performing animal-assisted therapy -- equines and caprines also do this job. Any therapy animal must possess a good disposition, remaining calm even in a hectic atmosphere. Animal-assisted therapy runs the gamut, helping patients deal with physical, mental and emotional issues. Animal-assisted therapy involves incorporating trained, screened, and healthy animals into a patient's treatment plan to help the patient meet specific goals. Equine-assisted therapy has long treated people with disabilities, often through riding and driving programs. Donkeys can take part in formal equine therapeutic riding classes, or patients can receive therapy through grooming or just stroking a gentle donkey. According to the British-based Donkey Sanctuary, even the most disturbed, agitated children relax when petting or talking to donkeys. In riding therapy, instructors work on specific skills and goals for the individual student. Most therapeutic riding programs rely on volunteers to lead the donkeys and perform other tasks. You already know how entertaining your goats can be -- that's one reason they make good therapy animals. Smaller breeds, such as pygmies and Nigerian dwarfs, might be the best choice because they are small enough to sit in a patient's lap. All therapy goats must be polled, meaning they must be without horns. Potential therapy goats and donkeys should be affectionate, genuinely liking people. Besides their entertainment value, goats can bring withdrawn people out of their shell. The presence of therapy animals help lower patients' blood pressure and lifts their spirits. 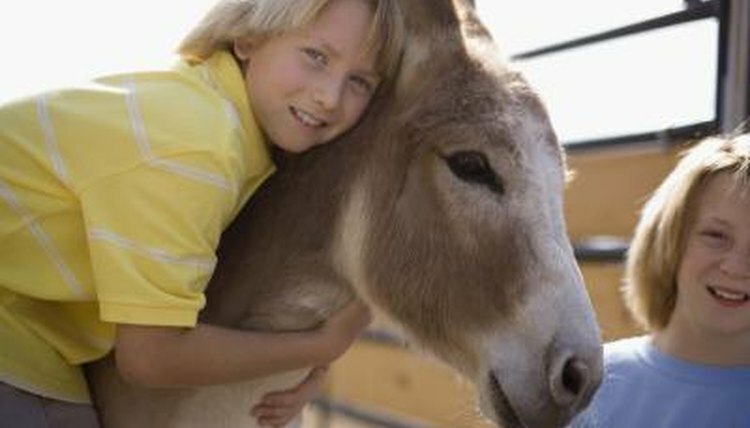 If you're interested in using your donkey or goat in animal-assisted therapy, you and your pet require training. You need good social skills yourself, in order to interact with patients with various disabilities or illnesses and to ensure that your donkey and goat are always in a safe situation. Your donkey or goat requires a thorough veterinary examination and health certificate before most facilities will allow you to participate in their programs. National organizations such as Pet Partners, formerly the Delta Society, can give you information about certified animal-assisted trainers in your area.